Smartphone apps like HUDWAY (seen here) can augment your view while driving in low visibility conditions. But is this tech ready for mass consumption? Some drivers like to navigate by memorizing street names. Others rely on landmarks and a general feel of their surroundings. The problem is the Force doesn’t always get me where I want to go, and as a result, my wife has long been anointed the family navigator. Recently I was watching a Brian Cooley video on CNET about the best car apps for your smartphone. Seconds later, I was ready to add a little augmented reality to my windshield. I’m already taking full advantage of the GPS tech in my iPhone while driving. The forward-looking arrow in the Google Maps app (or the native Maps app) is always a helpful buddy to keep me on course. And Siri calmly reminds me when the next turn is coming. But when I’m driving at night or in low-visibility conditions, it’s harder to maintain that symbiotic connection, because you can’t see as far ahead as your app can. So the solution is to add a little HUD technology into your smartphone. 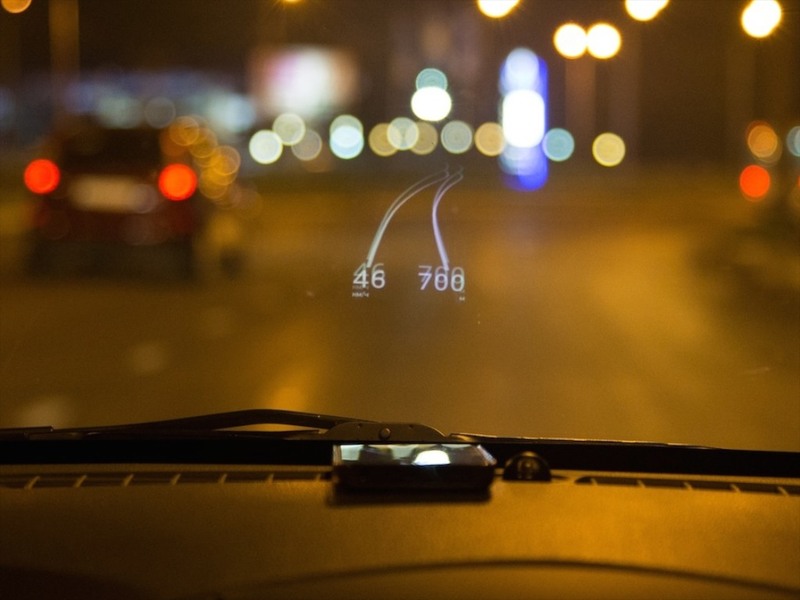 HUD, which stands for ‘Head-Up Display’ projects an image onto your windshield so you don’t have to look down at your smartphone. Yes, you simply plop your smartphone on the dash near your windshield, and it illuminates useful car-centric data. The trick is the display uses a mirrored effect. The image glows in reverse it and bounces off your windshield like a mirror to appear correctly for you to view. Depending on the app you use, different sorts of data can be projected, but I think the coolest scenario is to see your digital directions and path on your windshield. Sure, you’ve got to mount your smartphone onto your dash in a way that it doesn’t slide around. I already had a dash mount with a tacky bottom for my iPhone to use. My first step was to watch the CNET video again. But a problem immediately cropped up. Brian didn’t actually mention the apps by name. So I had to do the heavy lifting myself. But after some intense googling, all I could find were three options for this type of directional assistance. The good news is this free app (99 cents for ad-free) displays the road ahead and your upcoming turns. The bad news is there’s no voice assistance. And it pre-maps your route, which is useful if you lose your cell connection, but not so great if you go off course and need the app to recalculate your route on the fly. It’s also got some negative reviews on iTunes. I think this is the app Brian was specifically referring to in his CNET video. But Sygic is an offline navigation app, which means you’ve got to first download your maps information. And with all the content on my already bloated iPhone, I wasn’t too excited to start feeding it all the roads in the USA. Plus, even though the app is free, the required map info is a $35 in-app purchase. And to add insult to injury, the HUD feature is another $8 on top of that. So it’s a least $43 to give Sygic a test drive. And that’s a little pricey when you’re used to spending a couple bucks on an app. If you were wondering who makes a full-on, separate HUD device, yes, it’s Garmin. The Garmin HUD goes for $149.99, and it pairs with your smartphone to operate. Of course, this seems crazy expensive compared to a buck, but maybe not so much if you were ready to drop a Ben Franklin on the Sygic app. And remember, I broke up with my old Garmin ‘GPS Jane’ over a year ago. So the problem is the perfect HUD driving solution doesn’t exist. And definitely not at the right price point. You would think that the Google Maps app or Maps would simply have a HUD mode you can click into. If I’m missing something, please let me know…. But in this particular instance, it would seem the future isn’t closer than you think. This is still a concept ahead of its time. That’s only going to cost you $135,925. No, thank you, Mr. Hunt.